Trump's call to repeal tax rule could allow hospitals to support candidates. But would they? 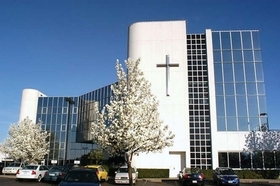 Mercy Medical Center in Redding, Calif. would be one of the hospitals affected by the repeal of the Johnson amendment. President Donald Trump told faith leaders this week that he would “get rid of and totally destroy” the Johnson amendment, which prohibits certain tax-exempt organizations, including hospitals, from engaging in political activity. Although Trump was specifically discussing his desire that faith leaders be able to engage in political speech, the Johnson amendment applies to all 501 (c) (3) organizations, including not-for-profit hospitals. Currently, these organizations risk losing their tax-exempt status if they endorse or oppose a political candidate, either financially or simply through speech. Trump said repeal of the amendment would let faith leaders "speak freely and without fear of retribution." He initially made this promise on the campaign trail and his plans for the Johnson amendment may be further revealed in an anticipated executive order on religious freedom. A draft that was leaked does reference changes to the tax code, though recent reports suggest that the document may have been changed further. One legal argument for keeping the amendment is that, if charities are allowed to direct donations to a candidate, the government would be subsidizing those donations by providing the tax deductions that are currently given to charity donors. But opponents of the amendment, especially churches, want to back candidates who support their charitable missions. Calls for the amendment to be repealed have been thrown around over the years, and some churches have openly defied the ban during church services as a part of the Pulpit Freedom movement. Hospitals have been much less vocal, if at all, about the issue. The Catholic Health Association, which represents catholic providers, didn't respond to a request for comment. The American Hospital Association declined to comment, and a spokesman for America's Essential Hospitals also declined to comment, saying that the organization doesn't believe it will impact its membership, which mainly consists of safety-net hospitals. Several of the nation's largest not-for-profit hospital chains, both secular and faith-based organizations, either declined to comment or didn't return a request for comment. A spokeswoman for Sacramento-based Sutter Health said she can't speculate on what the system would do if the amendment were repealed, but "as a not-for-profit organization, Sutter Health is a caretaker of community assets. We build community partnerships and support efforts that underscore our mission—improving the health of communities." Hospitals already advocate for or against regulatory measures and legislation, both at an individual level and through the aforementioned trade organizations. Many hospitals are the biggest employers in the 435 federal congressional districts across the U.S. Given that importance, they're likely to be in regular communication with members of Congress, said TJ Sullivan, a partner at Drinker Biddle & Reath who advises not-for-profit providers and health-plans on tax-exemption matters. There were over 2,845 non-government not-for-profit hospitals in the U.S. in 2015, the latest year for which data is available from the AHA. Not-for-profit health plans can be classified as a 501 (c) (3) or a 501 (c) (4), and there's not a clear record of how many are classified in the former. 501 (c) (4) organizations are allowed to support candidates. If they were legally allowed, hospitals might want to influence local, state or federal political officials responsible for hospital bonds, grants for indigent care or public health projects, said John Pomeranz, a partner at Harmon, Curran, Spielberg & Eisenberg who is an expert on the Johnson Amendment. On the other hand, they may want to remain nonpartisan so not to offend any prospective patients, he said. Many hospitals like the ability to appear apolitical, said Doug Mancino, a partner at Seyfarth Shaw who advises healthcare and not-for-profit organizations on tax matters. If given the chance, they likely wouldn't take wide advantage of a Johnson amendment repeal. “They don't want to get in the business of picking winners because if you start doing that…you have to go on both sides of the aisle,” said Mancino, who heads Seyfarth Shaw's health law group. Hospitals have other ways of supporting candidates, Mancino said. Large systems may have Health Maintenance Organizations that, if they're classified as 501 (c) (4), can support candidates, or they may have a for-profit subsidiary, which would be allowed to support candidates. Smaller systems or freestanding hospitals are usually able to have a sufficient voice through local or state hospital associations, which can support candidates at varying levels of government. Health system executives also frequently show their support of candidates by making donations to political campaigns or participating in political action committees, as they did in the most recent presidential election. Twenty-five out of 100 prominent healthcare executives cumulatively gave nearly $75,000 to Trump's opponent, Democrat Hillary Clinton. Not a single executive out of that group donated to Trump's campaign, even though many had previously donated to conservative politicians and causes. “Where it strategically makes sense with good advice, not-for-profit health systems can figure out ways to (donate) at the federal level as well as at the state level,” Mancino said. Under the tax code, charities still have a responsibility to be engaged in charitable and educational activities, “so you're not going to see a hospital or a church or a soup kitchen spending all their times and ads trying to beat this candidate and elect this candidate," even if the Johnson amendment is repealed, Pomeranz said. The Internal Revenue Service, the nation's tax agency, isn't aggressively enforcing the Johnson amendment at the moment, in part because it's difficult to enforce, said Ryan Oberly, a partner at Chicago-based Wagenmaker and Oberly, a firm serving not-for-profits. While it's easy to enforce the amendment's prohibition of financial support to candidates, it's much harder and more controversial for the IRS to regulate the speech of not-for-profit leaders, especially clergy. The amendment, proposed by then-Senator Lyndon B. Johnson a decade before his time as president, "wasn't well thought out,” Oberly said, noting that regulators may want to look at making rules that clarify the law. Some say Johnson, a Democrat, proposed it out of fear that right-wing groups would mask themselves as charities in an effort to influence voters in his future presidential campaign or other elections. Though it decried Trump's call to repeal the Johnson amendment, watchdog Public Citizen does believe the tax code needs to be clearer about what a not-for-profit can and can't do when it comes to politics. The group's Bright Lines Project is pushing for a clarified tax code that clearly allows not-for-profits the opportunity to participate in politics by advocating on issues and educating voters, while guarding against abuse by political campaigns.